Adam Brookes wrote a revealing article today on a newly declassified document from the Pentagon called "Information Operations Roadmap" (pdf). It was obtained by the National Security Archive at George Washington University using the Freedom of Information Act. 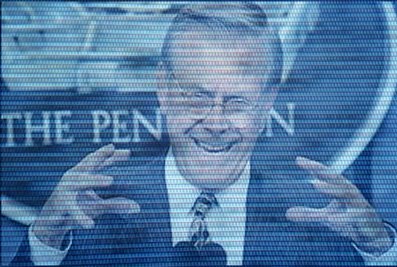 This is Rumsfeld's blueprint for "a far-reaching overhaul of the military's ability to conduct information operations and electronic warfare. And, in some detail, it makes recommendations for how the US armed forces should think about this new, virtual warfare." From the BBC: The document says that information is "critical to military success". Computer and telecommunications networks are of vital operational importance: public affairs officers who brief journalists, psychological operations troops who try to manipulate the thoughts and beliefs of an enemy, computer network attack specialists who seek to destroy enemy networks. It acknowledges that "Information intended for foreign audiences, including public diplomacy and Psyops, is increasingly consumed by our domestic audience." When it describes plans for electronic warfare, or EW, the document takes on an extraordinary tone. It seems to see the internet as being equivalent to an enemy weapons system. "Strategy should be based on the premise that the Department [of Defense] will 'fight the net' as it would an enemy weapons system," it reads, and contends that US forces should be able to "disrupt or destroy the full spectrum of globally emerging communications systems, sensors, and weapons systems dependent on the electromagnetic spectrum". A group of current and former intelligence officers and academic experts will soon gather for a conference to discuss the "emerging field of intelligence ethics," in which determinations about ethical spying can be made, and whether there is a moral compass espionage can follow. "Organizers said conferees would ponder such timely issues as how many civilian deaths can be justified in a C.I.A. Predator missile strike to kill a known terrorist, or what legal assurances a National Security Agency eavesdropper should demand before singling out the phone calls of an American who was linked to Al Qaeda."